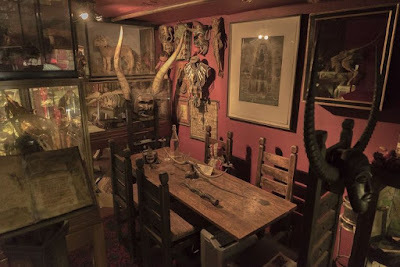 Officially, the so-called 'Laine Collection' had its genesis in the efforts of Sir Thomas Laine to preserve curios and other artefacts during the English Civil War. Various items were entrusted to Laine by various landowners to safeguard them as Parliamentarian and Royalist forces clashed with one another within the boundaries of the county. Sir Thomas is notable for organizing a wagon train to evacuate the collections during the Siege of Gwentford in 1644, then hid the collection on his estate until after the Restoration. 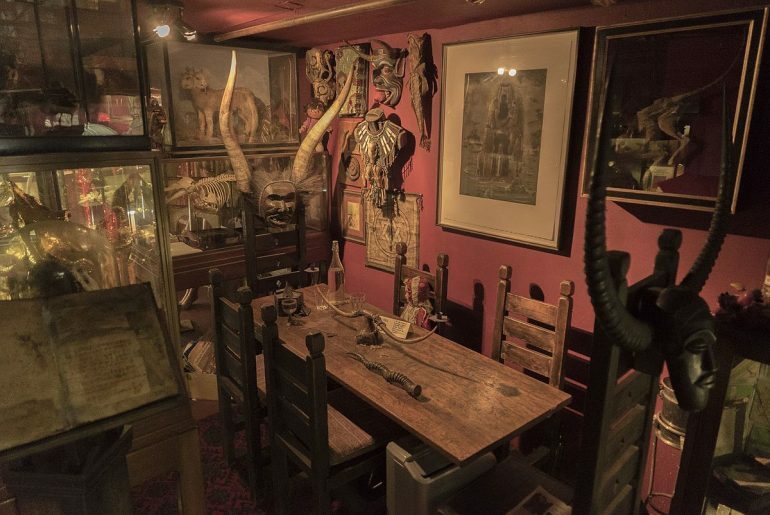 The Collection continued to grow until it was eventually entrusted to the care of the Gwentshire Archaeological and Natural History Society, who later used the Collection for the founding of the 'Gwentford Museum' in 1889. The museum, renamed the Gwentshire County Museum in the early 1900s, still houses the Collection but only has a small part of it on display to the public. The official story isn't that far off the truth, the Collection was the result of Sir Thomas attempting to safeguard certain artefacts during the English Civil War. It is generally unknown that Sir Thomas had a more secret motivation for doing so; he did it to help the Mist-Bound. Sir Thomas first became aware of the Mist-Bound in the late 1620s, though at first he thought them to be little more than demons. It was only after an encounter in 1637 that he realised that they were the spiritual guardians of Gwentshire and quickly set about trying to help them however he could. With the outbreak of the English Civil War 1642, Sir Thomas realised that dark forces could use the conflict to strike at the source of the Mist-Bound in hope of critically weakening them. Sir Thomas soon raised a band of men and women to help him acquire artefacts he knew were important to the Mist-Bound so that he could safeguard them, though as a cover he offered protection for the valuables of the local nobility in the area. The Collection would remain in the care of the Laine family for the next hundred years, though there were attempts by outside forces to destroy it (a fire in the 1760s came close to destroying the whole Collection). Eventually Sit Thomas' descendant, William Laine, would entrust the Collection to the Gwentshire Archaeological and Natural History Society after his son and sole heir was killed during the Crimean War in 1854. The Society set about cataloging the Collection, then decided to use it as the foundation of a museum which opened to the public in 1889. Attempts continued to steal or destroy parts of the Collection, leading the Society to decide to only put a small part of it on public display whilst moving the rest to safe storage. Occasionally, larger parts of the Collection have been put on display as part of some exhibition. In the present day, the Collection is still housed at the Gwentshire County Museum. An air raid shelter, built during WW2 in the museum's basement, and later refurbished in the 1990s contains the bulk of the Collection. As mentioned previously, a small part is on public display but the items are periodically rotated between being in storage and on display. The museum grants access to the Collection for those who can prove a valid scholarly interest. There are a few options for GMs with regards to using the Collection in their games. The main option is using the Collection to aid the players, either to fight some supernatural foe or find out key information. The best way of using this is have a player roll Investigation and then add +1 for a success and each raise (to a max of +4) on either a Knowledge (Occult) roll or an attack on a supernatural foe. Other rolls for the bonus include Streetwise or other Knowledge skills, possibly even on Intimidation on certain characters. Another option is to use the Collection to link campaigns set in different time periods. A 'past' campaign could see the player characters retrieving an item for the Collection and then needing that item in a campaign set years or even decades later. An example could see the characters being part of Sir Thomas' band in the 1640s collecting artefacts against the backdrop of the English Civil War, then having those some items show up in a 1930s era campaign either to stop a big bad or even being stolen by the characters. Finally the characters could be out to destroy the collection, particularly if they are under the impression that the Mist-Bound are evil beings needing to be defeated. This option could result in the characters releasing a truly evil and powerful being which they'll have to somehow defeat, a task that could've been made more difficult if they have destroyed an item that could have been used to defeat said being.